WHAT HABITS CAN AFFECT YOUR BRAIN FUNCTION? There may be lot of things you take for normal and do everyday that affects your brain functioning and even damage its structure in the long run. Certain habits like staying up late into the night, not having breakfast and getting too stressed through the day are not brain healthy habits. Though these are dangerous by themselves the ability to change your lifestyle can help regain brain and body health. The brain is a complex and delicate organ that has a say directly or indirectly in each of the body function. It regulates functions like heartbeats, blood pressure, hormonal balance, body temperature and so on. Brain is responsible for movement, learning, memory, emotions and cognition etc. with impact on the overall health of the human body. 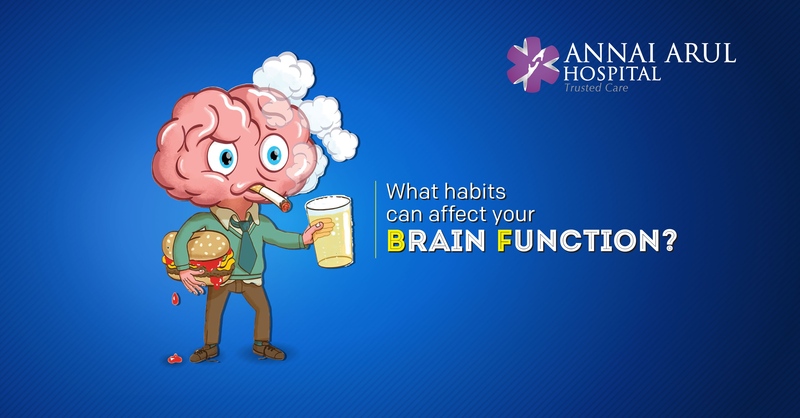 Here are few bad habits that can cause damage to the brain. In the morning as you get up brain starts allotting nutrients for various physiological processes. This happens after a long fast that the body is subjected to. If you don’t eat breakfast you will not be supplying enough energy for various functions of the body. Breakfast gives the energy the body needs and also helps in gaining concentration, memory, bad moods, and poor intellectual and physical performance. In the long run this habit could create havoc with the body functions. Smoking is a very harmful habit since it reduces the the oxygen supply to the brain. Smoking is considered to cause neurodegenerative diseases like Alzheimer’s disease. The toxins release from cigarette combustion interferes with DNA production, leading to mutations causing cancer cells to develop. The intake of high quantities of refined sugar daily and in high quantities promotes accumulation of harmful substances in the body. The increased sugar in the body interferes with immune functioning and slows down neurological development thus affecting the efficiency of the brain. It is a known fact that our body needs at least 8 hours of sleep at night, so that the brain can rest and recoup. This also helps in maintain the metabolic process in it proper way which leads to production of energy, as well as cellular renovation. When we deprive ourselves of sleep everyday, it slowly accumulates and causes death of brain cells which keeps you tired and in a bad mood every day. Most of us are in the habit of taking larger quantities of food than actually food that will satisfy our hunger. We also have the habit of snacking on fired and unhealthy food. The result from all this overeating is the accumulation of residual substances like fats and hardening of the cerebral arteries. This causes great damage to the brain and its functioning. Alcohol as you know damages organs like the liver and the heart apart from the nervous system. This impairs the chemical reactions in the brain and damages brain functioning. Alcoholism also kills neurons and reduces the speed at which nerve impulses are transmitted in the nervous system of the brain. For optimum functioning of the brain many of the bad habits have to be rectified and then you can enjoy absolute health in body and mind.